Sparging flexibility offers excellent adaptability to a broad range of cell lines. Low shear, high input-power impeller for gentle, efficient mixing for sensitive cells or media. Optimized impeller position helps maximize mass transfer and turndown ratio. Industrial-grade automation ensures process performance and consistent data management. The XDR-10 single-use bioreactor system is versatile enough to handle volumes from 4.5 L to 10 L. The system is available in Single, Twin, Triple, and Quad vessel configurations. 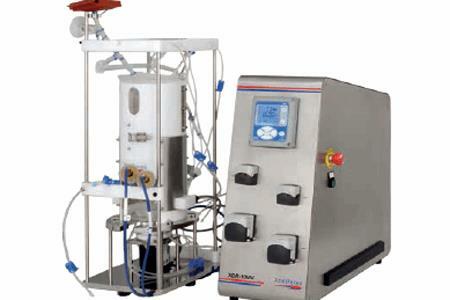 The XDR-10 system features the same fluid contact materials, fluid dynamics, and control strategies as the 50 L, 200 L, 500 L, 1000 L, and 2000 L bioreactors. Like other Xcellerex single-use bioreactor systems, this model is suitable for GMP clinical and commercial manufacture of biotherapeutics, vaccines, and other biologics.